The State Collaborative on Reforming Education (SCORE) today released a list of the top three education priorities for continuing the state’s recent unprecedented student achievement gains in a new report, 2016-17 State of Education in Tennessee. SCORE, a nonpartisan education research and advocacy nonprofit organization founded by Senator Bill Frist, MD, each year compiles the State of Education report to examine recent successes in K-12 public education and identify opportunities for continued improvement in academic achievement. The 2017 report outlines an agenda to keep Tennessee on track to remain among the fastest-improving states for student achievement, to close achievement gaps for historically underserved students, and to prepare all students for postsecondary education and the workforce. 1. Accelerate support for Tennessee’s educators. The report recommends improving teacher compensation, strengthening teacher preparation, building school leadership pipelines, and maintaining the commitment to the multiple-measure teacher evaluation system as a tool for improving instruction. 2. Drive toward excellence and equity for all Tennessee students — especially underserved students. The State of Education report calls for expanding access to highly effective and diverse teachers. Tennessee should continue pushing forward with a new plan for an accountability system that serves all students and give all students rigorous early postsecondary and career opportunities in high school, the report says. 3. Stand firm on Tennessee’s policies that have led to historic gains while seizing opportunities to advance innovation. The report points to the link between Tennessee’s student achievement gains and its policies for academic standards, assessment, and accountability, and it emphasizes that teachers and students need stability in those systems. The report also calls for Tennessee totake advantage of opportunities to spur additional improvements in student achievement through innovation, specifically related to professional development and scaling up high-quality instructional strategies and materials. “The list of priorities reflects an agenda not just for SCORE but for the entire state of Tennessee. Inside the 2016-17 State of Education in Tennessee, are specific, detailed calls to action – and every education partner in the state can find at least one to work on this year,” Woodson said. SCORE presented the report findings to educators, policymakers, and community and civic leaders during an event at War Memorial Auditorium in Nashville. Speakers included educator Lindsey Hagan, an assistant principal in Hamilton County and member of the SCORE Steering Committee; advocate Tosha Downey, director of advocacy for the Memphis Education Fund; and business executive Joelle Phillips, president of AT&T Tennessee and a member of the SCORE Board of Directors. • A 2010 priority called for building public support for higher expectations in the classroom. Later that year, the Expect More, Achieve More Coalition was founded. • A 2012 priority urged Tennessee to provide excellent professional development to help teachers use higher math and English standards to accelerate learning. 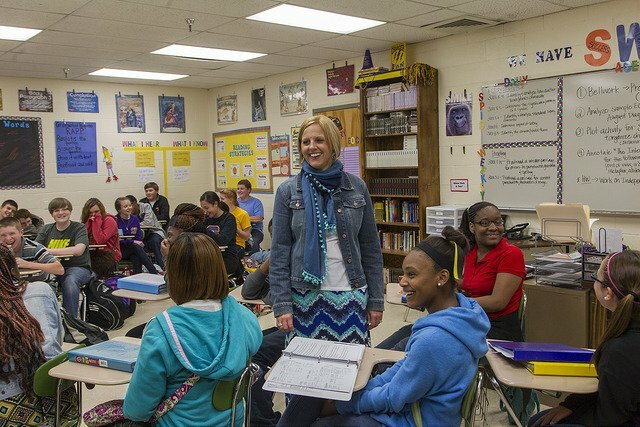 Tennessee went on to train more than 60,000 teachers. • A 2016 priority recommended elevating teacher voice. Now the Tennessee Teacher Leadership Collaborative is building a statewide network to expand teacher leadership opportunities. In compiling the report and identifying the priorities, SCORE analyzed Tennessee student achievement data and current education research and held conversations with more than 150 Tennessee teachers, education leaders at the local and state levels, and national education partners.